Algebra is a branch of mathematics that studies the rules and relations of expressions and equations. It is considered a branch of pure mathematics because it deals entirely in abstract concepts. In an algebraic equation, a letter is called a variable. A variable represents a missing expression or numerical value. To find the value of a variable in an algebraic equation, you have to isolate the variable using different mathematical functions, such as addition and division. Take a moment to inspect the algebraic equation. Identify your variable; your variable can be any letter, from a to z. Decide what mathematical functions you need to use to get the variable by itself on the left side of the equal sign. In the example x - 4 = 10, notice the subtraction sign in the problem. That is an indication that you will be using addition and subtraction. In 2x - 4 = 10, notice the coefficient in front of the variable. In this case, you will be using multiplication and division as well as addition and subtraction. Use the algebraic order of operations to decide which mathematical functions to apply to the problem first. You should always go in this order when solving an algebraic equation: Solve expressions in parentheses first, then exponents, then expressions being divided, coefficients (multiplication), and finally expressions using addition and subtraction. An easy way to recall this order is to remember the acronym PEMDAS -- Please Excuse My Dear Aunt Sally. Solve the problem by applying the mathematical functions needed to isolate the variable. In x - 4 = 10, you should isolate your variable by adding 4 to each side of the equation: x - 4 + 4 = x. Then, 10 + 4 = 14. Your problem now reads x = 14. The solution is 14. In 2x - 4 = 10, you should first solve your expression that has a coefficient, 2x. To do this, divide each expression in the entire problem by 2: 2x ÷ 2 = x; 4 ÷ 2 = 2; and 10 ÷ 2 = 5. So your problem now reads x - 2 = 5. Add 2 to each side of the equation. x - 2 + 2 = x, so your variable is isolated. Then, 5 + 2 = 7. You problem now reads x = 7. The solution is 7. Check your solution. Take the answer you received and substitute it for the variable in the original problem. In x - 4 = 10, substitute x for 14. The problem now reads 14 - 4 = 10. If that's correct, you have the correct solution. If not, go back and rework the problem. The most important thing is to use whatever mathematical functions are necessary to isolate the variable. Remember that whatever mathematical functions you apply to one side of the equal sign, you also have to apply to the other side of the equal sign. 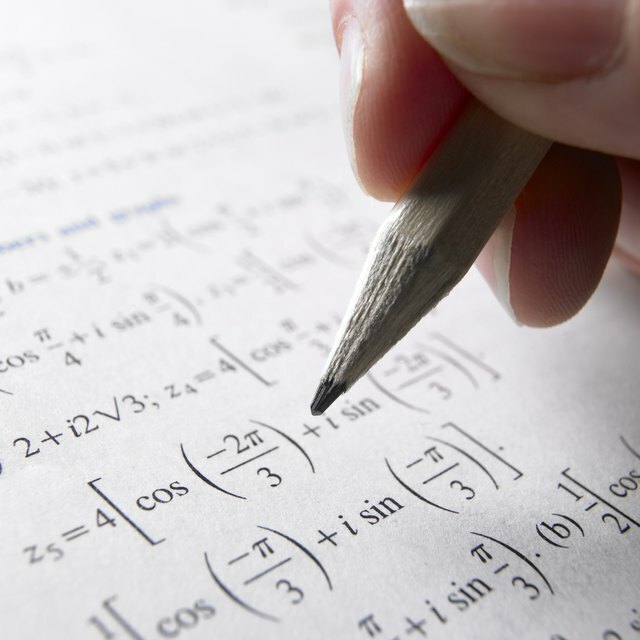 Teachers Choice: How to solve linear equations in one variable using algebra. Johnson, Baptist. "How to Get the Value of a Letter in Algebra 1." Sciencing, https://sciencing.com/value-letter-algebra-1-8181468.html. 24 April 2017.